Kraalbos Mankind has used natural medicines for centuries to cure different ailments. Before the advent of modern pharmaceutical technology, which resulted in the commercial manufacture of pharmaceutical drugs, doctors had to rely on natural techniques and herbal remedies to treat illnesses or heal injuries of their patients. Everything from the common cold to life-threatening conditions such as cancer, diabetes and heart disease have been purported to be successfully treated without the use of current pharmaceutical medical equipment and pharmaceutical drugs. Herbal medicine utilizes the body’s natural healing process for treating conditions. The ingredients used are those which are regularly produced in the body. This improves the power of the human body to heal itself. While pharmaceutical drugs are infamous for causing severe side effects in patients such as nausea, diarrhea and vomiting, herbal medicine are absolutely free of side effects and do not harm the body in anyway. Herbal remedies are completely natural and have no manufactured drug composition. Due to their natural nature, they do not need special prescription to consume regularly. These natural remedies also result in a better immune system. Herbal remedies are cheaper than conversional drugs. This is because herbal medicine does not have high manufacturing costs as opposed to conversional drugs. Herbal Remedies are easily accessible. Certain herbal remedies like ginger, peppermint and basil leaves can be acquired and grown anywhere in the world. Herbal remedies are preventive in nature. Not only are they known for their excellent curing abilities, but they have also proven to prevent future outbreaks of the illness. Herbal remedies are non-addictive, unlike for example, pharmaceutical pain medication that contains Codeine. Codeine is addictive and makes the pain to come back more often. In recent years, there has been an increase in the move back from pharmaceutical drugs to natural medicines, mainly because of the above mentioned benefits of natural medicines over their conventional counterparts by a large population of the world. Kraalbos happens to be one of the herbal plants that is used for a wide range of ailments. Traditionally, Kraalbos’s medicinal knowledge has been passed from generation to generation of the Khoisan people. The Unit for Technical Assistance (UTA) conducted a financial feasibility study into the prospects of Kraalbos as an entrepreneurial venture. While the general findings of the study may be published, the individual business related findings of the study cannot be published as they are confidential and specific to the business in question. 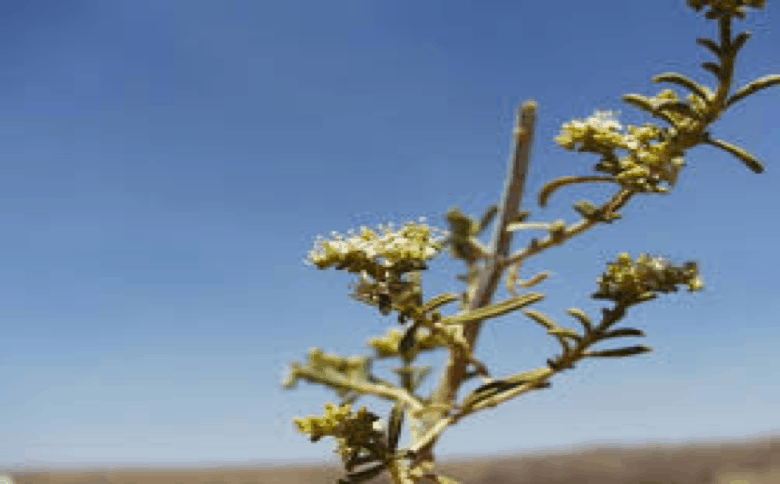 Kraalbos or Geelbos is a plant that some may consider to be a member of invasive plant species in particularly disturbed areas of mainly the Northern Cape, Western Cape, and the Eastern Cape provinces of South Africa. The plant has green leaves that turn yellow as it ages. It has small yellow flowers during October to December when the plant blooms. Figure 1 below shows an example of the Kraalbos plant. Kraalbos has been found to reverse the resistance of crop pathogens when applied in conjunction with standard pesticides. This particular attribute of Kraalbos is very important in the agro-chemical industry. The antimicrobial properties of kraalbos can be applied to plants as a bio-stimulant so that it can increase the polyphenol and total soluble solids content of the plant. This will increase crop or individual plant health and ultimately improve crop yield. It is used to make Kraalbos soap, shampoo that is very good on dandruff, body-wash, different antifungal and medicinal ointments. Kraalbos presents a very good business opportunity for especially the unemployed or even employed citizens who have access to Kraalbos areas. There are various business opportunities in the whole value chain, as this is still an unexploited business sector. There are business opportunities in the collection of the plant, in the extraction stage, and the transportation of the plants for extraction. There are very few companies that are in the extraction and making of Kraalbos commercial products at the moment. Thus, the potential sector growth is very high and with it, the different entrepreneurs that choose to enter the industry. However, it must be noted that the general financial gains cannot be quantified at the moment as this is a developing sector.